Click trails provide online retailers with valuable insight into consumers’ shopping habits. The retailer uses this insight to influence purchase behaviors by making real-time adjustments to product pricing, promotions and information. The online retailer can also measure and influence aggregate shopping patterns, such as cart abandonment rates, in near real-time. Any adjustments can be quickly measured, and if the impact does not meet the desired goals, further adjustments can be made and then re-measured. The brick-and-mortar retailer is not quite so lucky. They lack real-time insight into consumers’ shopping patterns and are forced to create shopping assumptions based upon metrics derived at checkout. Without real-time insight, these retailers cannot influence a shopper’s propensity to buy in real time. This, however, is about to change. Technology is quickly evolving to equip the real-world retailer with the tools to both measure and then influence consumers’ shopping behavior. This shopping revolution will be spearheaded by the growing adoptions of a technology called near field communications (NFC). NFC is a derivative of a 1940s technology called radio frequency identification (RFID). Both RFID and NFC are communications technologies that can transmit information wirelessly over very limited distances. RFID chips can transmit information over a few meters, while NFC chips can transmit information to only a few centimeters. While both NFC and RFID share the same conceptual beginnings, each technology has evolved to serve different needs. RFID has evolved into a technology that can transmit information to products with an attached microchip. NFC has evolved into a technology that delivers information pertaining to, or of interest to, an individual. RFID is used in commercial applications, such as inventory tracking, toll tags, luggage tracking, meter reading and inventory warehousing. NFC is used in end-user applications, such as building access cards, credit cards, personal identification cards, health cards, transportation ticketing and marketing promotions. Commercial readers, such as warehouse inventory scanners and turnpike gantries, have traditionally been used to read RFID tags. Fixed readers, such as building access pads and credit card payment terminals, have traditionally been used to read NFC tags. This, however, is rapidly changing. A rapidly growing number of smartphones are now being built with NFC readers. This is creating applications for NFC that were not practical a few years ago. NFC tags can now be attached to physical objects to transmit information to NFC-equipped smartphones. Once on the smartphone, the NFC-delivered information can be used for a broad range of purposes, which includes, but is not limited to, marketing, commerce, payments, influence and entertainment. As more NFC-equipped smartphones are sold, more NFC tags are being deployed. The advertising industry has been at the forefront of deploying NFC tags. In fact, the out-of-home (OOH) advertising industry has been one of the early adopters of NFC. Earlier this year, JCDecaux placed smartposters (print posters with embedded NFC tags) in bus stops located throughout the British town of Reading. The smartposters were designed to allow viewers to tap their NFC-enabled smartphones on these posters to receive additional information about the advertised product or service. JCDecaux found that consumer engagement was very strong. Since the Reading deployments, other OOH advertisers have followed suit with their own smartposters. Magazine advertisers were another early adopter of NFC. Last spring, Lexus ran an NFC-enabled ad within the pages Wired magazine. Readers could simply tap their smartphone on the ad to receive interactive information highlighting Lexus products. Today, Marie Claire magazine is running an NFC-enabled print campaign to promote a free gym membership. Kraft foods recently worked with Safeway to advertise its cheese and cookie products via NFC-enabled shelf tags. Kraft and Safeway found that customer engagement with the tags was strong and that tag engagement significantly exceeded that of a complementary QR code promotion. As NFC begins to extend its reach, brick-and-mortar retailers will be able to develop online-like insight into customers shopping patterns. Every tap on a tag will provide the retailer with information about what their customers are viewing, when they’re viewing it and what they tend to do after viewing it. Tag-enabled content will dynamically change as tap-centric trends emerge. Marketing campaigns and promotions will morph to accommodate changing consumer preferences. But where will brick-and-mortar deployments of NFC first appear, and how will they be used? The initial deployments will be targeted at enhancing the value of in-venue signage. Traditional print signs and posters will be enhanced to include NFC tags. Static signs will become digitally enabled with dynamic messaging. Retailers will likely spend less on refreshing their print signage since the underlying electronic message will change, but they will spend more on deploying more printed signs. As the number of signs increase, the scope and degree of consumer insight will increase. As the price of NFC tags (currently about 50 cents) drops, the use-cases for tags will grow. The reach of NFC will broaden from print signage into shelf tags. As the price drops further, tags will ultimately be integrated into everyday products. With each evolution, the retailers’ insight will grow. Today’s brick and mortar retailer has little insight into their customers’ shopping habits and patterns. This weakens their ability to influence basket-share. 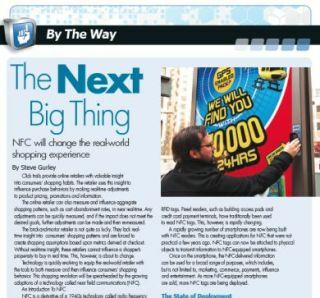 NFC stands to increase retailers’ ability to acquire greater insight and influence consumers’ shopping patterns. Retailers will initially focus NFC deployments at enhancing the value of print signage, but the deployments will eventually evolve to include everyday products. With each deployment, the retailers’ ability to influence basket-share will grow.